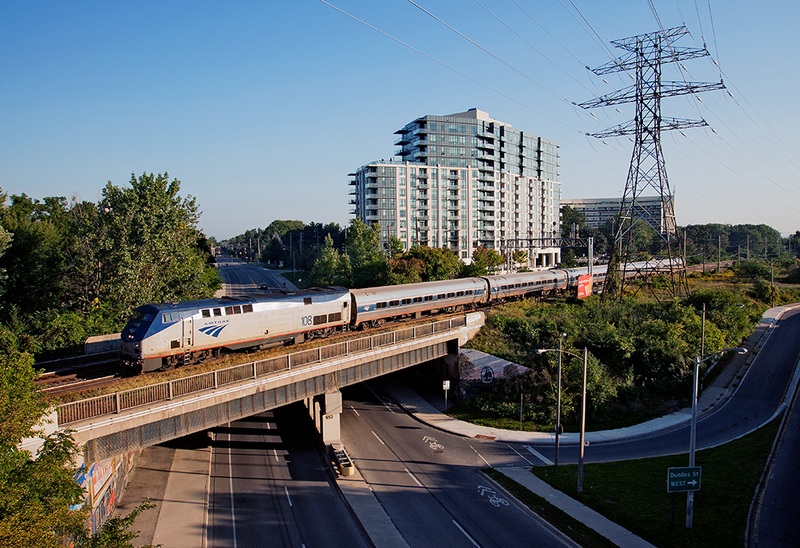 Railpictures.ca - Michael Da Costa Photo: Maple Leaf over Royal York VIA97/AMTK68 crosses over Royal York Rd along with CP Galt Sub, this short detour over the Galt/Canpa Subs is due to the preparation of Humber River bridge replacement. | Railpictures.ca – Canadian Railway Photography – photographie ferroviaire Canadienne. Caption: Maple Leaf over Royal York VIA97/AMTK68 crosses over Royal York Rd along with CP Galt Sub, this short detour over the Galt/Canpa Subs is due to the preparation of Humber River bridge replacement. Nice catch. AMTK 64 though, no? 68 is the Adirondack (694 while on CN rails). Oh you crazy railroaders/railfans. You know just where to be at the right time.